Hometown MVP contest winner Chris Caldwell (left) receives a commemorative ticket from Doosan Infracore North America Director of Marketing Todd Roecker. 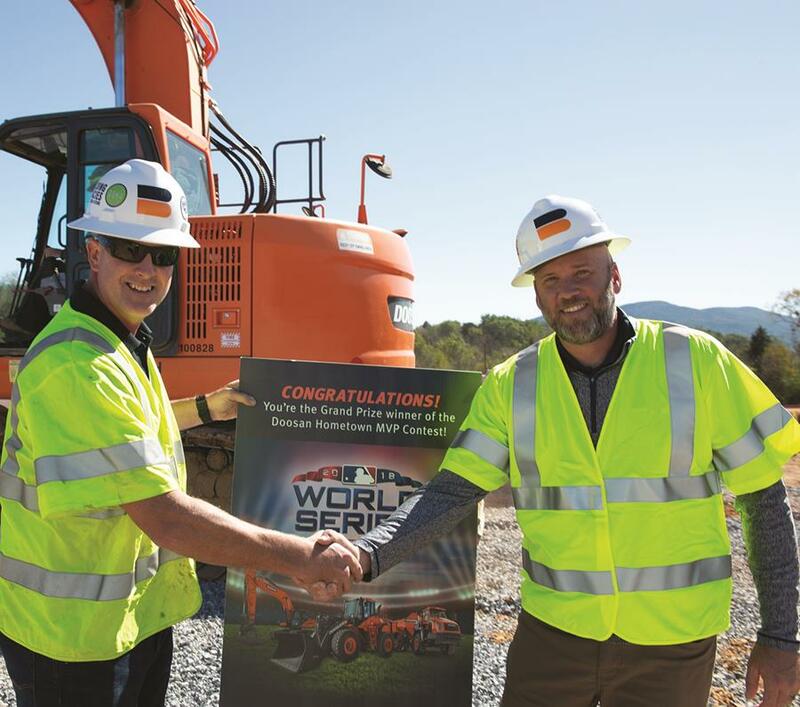 Doosan Infracore North America, LLC, selected Chris Caldwell of Roanoke, Virginia, as the Grand Prize winner of the 2018 Hometown MVP Contest. Chris won four tickets to Game Four of the 2018 World Series presented by YouTube TV. Hometown MVP Contest entrants were asked, “How do you use construction equipment to make your community strong?” Chris is an equipment superintendent at Branch Civil – a site development, design-build and heavy-highway construction firm – who has been with the company for more than 23 years. The certified equipment manager detailed in his entry how Branch Civil helps build schools, improves critical infrastructure in his growing community and performs works to help protect the ecosystem near the company’s jobsites. The First Prize runner-up winner was Chris Zehner of Monterey, Indiana. He received a $250 Doosan-themed prize package. The Second Prize runner-up was Christopher Gartner of San Antonio, Texas. He received a $100 Doosan-themed prize package. Doosan was the presenting sponsor of the 2018 National League Division Series™ (NLDS™). In 2017, Doosan was the first-ever presenting sponsor of the American League Division Series™ (ALDS™), and the NLDS agreement marks the second year of the company’s Postseason involvement with Major League Baseball. As an official partner of MLB®, Doosan received significant brand exposure across national broadcast and MLB-owned channels throughout the 2017 and 2018 Postseason™. In April 2018, Doosan announced a multi-year partnership with the New York Yankees®. The new partnership adds to the existing Doosan sponsorship portfolio, which includes a multi-year relationship with Major League Baseball. The partnership provides Doosan with branding and marketing benefits including permanent branding at the visiting team’s on-deck location, exclusive VIP hospitality experiences throughout the season and other experiences with players at Yankee Stadium™. Major League Baseball trademarks and copyrights are used with permission of the applicable MLB Entities. All rights reserved.